starting with ones listed on Skin Deep's Cosmetic Safety Database. Organic does not seem to be a priority on their lists however, organic is a big priority on my list for so many reasons...My health, environmental safety and supporting organic agriculture. While I'm not fond of the ingredients in all of their products (Many other products they have are not organic) I found their Green Screen last year and have been very pleased with the product. Why is Non-nano Zinc Oxide a good Sun Screen? Zinc oxide has a broader UVA and UVB absorbance spectrum than Titanium dioxide, so it provides better UVA protection. Zinc oxide is safer because it creates fewer free radicals than Titanium dioxide. Zinc oxide is made from a critical mineral nutrient that’s also found in your vitamins, Titanium dioxide is made from a toxic heavy metal." Other Sunscreen Ingredients: *Extra Virgin Olive Oil, *Beeswax, *Jojoba Oil, *Cocoa Butter, *Shea Butter, and CO2 Extracts of *Rosemary, and *Seabuckthorn Berry. This sounds even better and with the added benefits of Seabuckthorn! "As of March 1st, 2011, we manufacture our sunscreens using uncoated, non-nano Zinc Oxide. Below is information on the micronized Zinc Oxide we have used in our sunscreens for the past 5 years. 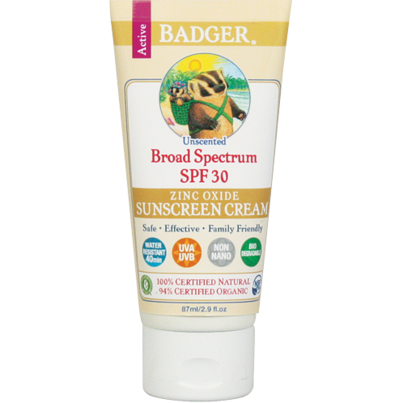 You may still find this product on the shelves as our sunscreen is good for 2 years from date of manufacture. We believe that micronized Zinc Oxide is absolutely safe when used within our sun creams but we decided to move to larger particle zinc this year because we were able to obtain the same high broad spectrum protection using less Zinc. " While he is sourcing organic and GMO free ingredients for Green Screen, he personally agrees with the science of Genetic Modification. This I can not support. As many others have argued, he too feels that GMO's will feed the world and ward off starvation. This is propaganda spread by those marketing genetic modification which has come to fool many, including other scientists. If you want to read about GMO's and what will actually feed the world...Here is an article I wrote three years ago (I will re-post it to the top). Also take the time to look at underdeveloped countries who have changed to organic and how well they are flourishing, as is the case with Cuba.